Joshua Slocum grew up by the sea. His grandfather was lighthouse keeper on Brier Island at the mouth of the Bay of Fundy, Canada, and his father made shoes for the local fishermen. But being close to the water wasn’t good enough. He needed to conquer it, until it conquered him. Slocum was one of eleven children, and his father was very strict. He couldn’t wait to find his place in the world with open space and less competition. The obvious place to head was out on the ocean. He tried to run away from home several times, and when he was 14 years old got hired as a cabin boy and cook on a fishing schooner. That didn’t last long, however, and he ended up back at home. Two years later, in 1860, his mother died in childbirth and Slocum couldn’t bear to stick around. He and a buddy headed out for Dublin, Ireland as merchant seamen. Slocum had found his passion and traveled the world. He earned his certificate as a Second Mate and ultimately became a Chief Mate of British ships. In 1865, San Francisco became his home base, and he became an American citizen. Slocum did not have to sail through life alone. He found his perfect first mate, Virginia Albertina Walker. For one month in 1870, his ship was in Sydney harbor, and he met and married Walker, who happened to be an American. She joined Slocum on his trips, and they had seven children, all born at sea or in foreign ports. Slocum commanded several ships across the Pacific. His hidden desire to be a writer was fulfilled as a correspondent for the San Francisco Bee. In 1884, the Slocum family was headed for South America when Virginia became ill and died. Not able to care for the children on his own, Slocum left the youngest ones with his sister in Massachusetts. His oldest son, Victor, became his new first mate. Two years later, when he was 40, Slocum married his 24 year old cousin, Henrietta Elliott. She was not as enamored by life at sea as Virginia had been, perhaps because during the first year they sailed through a hurricane and the crew contracted cholera which required being quarantined. In addition, sometime later they were stricken with smallpox, which killed three crew members, and finally, in 1887, they were shipwrecked in Brazil. Not wanting to spend the rest of their lives in Brazil, Slocum and two sons built a boat to sail back to the U.S. The family left on May 13, 1888 and arrived in Cape Roman, South Carolina after 55 days at sea. They reached their final destination of Boston in 1889. Slocum turned the stories of this trip into a book called Voyage of the Liberdade. Now, Slocum decided, it was time for a little adventure in his life, and he set out to circumnavigate the globe alone. He rebuilt an oyster boat named Spray and left Boston harbor April 24, 1895. He was 51 years old with 35 years of sailing experience to rely on. He visited his family in Nova Scotia and then set out on July 3, 1895. His route took him across the Atlantic to Gibraltar, south along the coast of Brazil and Argentina and through the Strait of Magellan, across the Pacific to Cooktown, Australia, around the Cape of Good Hope, and back up the coast of South America to Fairhaven, Massachusetts. Slocum’s sailing experience gave him the confidence to use dead reckoning instead of a chronometer to calculate longitude. His source of food was often the ocean itself. Flying fish would soar right onto the deck and make a tasty meal. In the Pacific, where he had his longest stretch of solitude at sea, he subsisted on food he picked up in port: mostly potatoes, salt cod, biscuits, coffee and tea. His quest took him through every type of weather, attacks by pirates and some close calls with other boats. In November 1895, Slocum ran aground in Uruguay and had to take a lifeboat to shore in very turbulent water. Ironically, Slocum didn’t know how to swim. He was tossed overboard and made three unsuccessful, flailing attempts to right the dinghy. As his life flashed before him, he said an exhausted final prayer and tried once more. It worked, and he was able to climb on the lifeboat and row to shore. At 1:00am on June 27, 1898, after over three years of seafaring, solitude, and struggle, Slocum sailed into Newport, Rhode Island to complete his 46,000 mile journey. He arrived one pound heavier than he left and was told by friends that he looked much younger. Slocum’s adventure made for compelling reading when he published Sailing Alone Around the World a year after his return. The profits from his book and lectures allowed him to set down roots and buy a farm on Martha’s Vineyard. Being rooted felt so contrary to his nature, however, that he couldn’t stay put. He sailed up and down the Atlantic during the summer and spent the winters in the West Indies, earning money from lectures and book sales. Slocum’s mental stability took a downward turn as he got older. He was convicted of indecent exposure to a 12 year old girl in New Jersey. He spent 42 days in jail awaiting trial, and after his family begged for a leniency, the judge sentenced him to time already served. Income was now sparse, so in 1909, at 65 years old, he tried to reinvigorate his life by planning a new adventure in South America. He started out on his annual trip to the West Indies in November, but he was never heard from again. Henrietta informed the press in July 1910 that she assumed he had been lost at sea. It was never determined what happened to him, but since he never learned to swim, he wouldn’t have been able to save himself if the boat had capsized. He was legally declared dead in 1924. QUESTION: What’s something you love to do so much that you might write a book about your experiences? What would it be called? 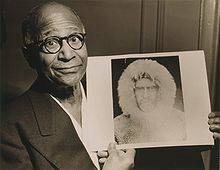 When Matthew Henson left home at age eleven he never looked back. He didn’t have much to return to so he kept going, to the end of the earth. Henson’s parents were free-born tenant farmers who finally settled near Washington D.C. His mom died when he was seven, and his father remarried. His father subsequently died and left young Henson and his siblings to their stepmother’s care. The problem was, she was burned out on farming and child care, so she often beat the children into compliance. Late one night after a severe beating, Henson made good on his promise to run away. He used his brother’s knife to cut his wool blanket into squares that he wrapped around his feet as makeshift shoes. Fear of being caught and returned home kept Henson hiding in the woods until nightfall. Then hunger and the cold forced him to seek refuge. Janey Moore, the owner of Janey’s Home Cooked Meals Cafe, took him in and gave him food, shelter and a job. Henson saved the $1.50 a week he earned and bought himself the first new clothes he’d ever had. A year later, Henson was ready to move on. It wasn’t that he was ungrateful, but he dreamed of being a sailor. “Aunt Janey” pressed a dollar into his hand and begrudgingly let him go. Henson walked from Washington D.C. to Baltimore where he ultimately met up with a Captain Childs and became his cabin boy on the ship Katie Hines. For five years Henson traveled with Childs and learned literature, math and navigation. Henson was 17 when Childs died, and he found himself doing odd jobs and bouncing around New England. Henson was working as a clerk in a store in Washington D.C. when Robert Peary, a lieutenant in the U.S. Navy, came in and learned of Henson’s maritime experience. Peary hired him to be his personal valet on a trip to Nicaragua. Upon returning to the States, Peary kept Henson on as an errand boy in his office at the League Island Navy Yard. In 1891, Peary made his first of several trips to Greenland with Henson on the crew. During these excursions, Peary mapped Greenland and made plans to find the geographic North Pole. 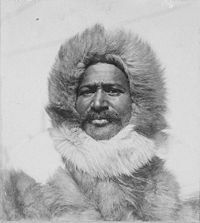 Henson spent extensive time with the Inuit people, learning their language, customs, survival skills and gaining their respect and a permanent connection. While in the States, Henson married Eva Flint. He wasn’t too keen on the fact that she got pregnant while he was in Greenland, so he divorced her. Then he married Lucy Ross, but they never had children. While in Greenland, however, Henson wasn’t deprived of companionship. 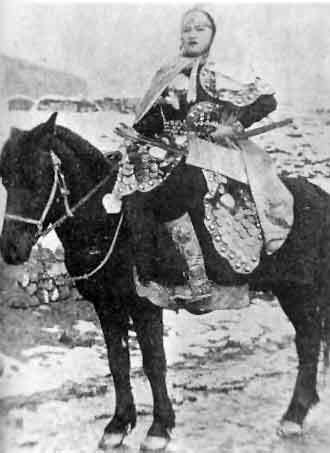 He had a relationship and a son with an Inuit woman, his only offspring. In previous attempts at reaching the top of the world, Peary and Henson had collected the world’s largest meteorites and went the farthest north any human had ever traveled. This was not, however, satisfying enough to stop trying to find the North Pole. Peary and Henson made the final attempt in 1909 on the specially build ship the Roosevelt. Accompanying them were several other Caucasian explorers, 39 Eskimos*, who traveled in families, and the husky dogs that would be pulling the sledges (sleighs). Time on board the ship was used by the natives to make suits of reindeer skin and polar bear skin. Henson was responsible for making the sledges, shaping the runners to curve up like a canoe to break through the ice. On March 1, 1909, at 6:30am, Peary, Henson and the others left the comfort and security of the Roosevelt at Cape Sheridan at Canada’s northern tip to cross 413 nautical miles of ice to find the Pole. Three days earlier the temperature had been 57 degrees below. Only one mile into the trip Henson’s sledge broke, and he had to stop and fix it in gale force winds, exposing his hands to bore new holes and securely rethread the sealskin ties. Every night they built igloos to sleep in, and they ate an Inuit specialty: dried meat pounded into powder and mixed with dried fruit call pemmican, and tea. The explorers weren’t able to travel as fast as they’d have liked due to natural obstacles known as “leads,” a gap where the ice has suddenly split to expose water. On March 4 a lead opened up that made them waste seven days of good weather. Finally, on March 11, with the temperature at 47 degrees below, the ice drifted back together, the lead closed, and they carried on with their journey. On March 20, Peary started cutting the crew for the final push to the Pole. By April 1, the only ones to make the last five marches over the ultimate 130 miles were Peary, Henson and four Inuits. Despite the cold and exhaustion, they managed to sustain a relentless pace. On April 3, Henson had a horrifying experience. While he was pushing his sled, the ice underneath him broke away, and he slipped and fell into the freezing water. He tried to grab the ice and pull himself up, but his gloves couldn’t get a grip. While he was flailing about, the Inuit Ootah reached down, grabbed Henson by the nape of the neck and pulled him out. Henson quickly changed into dry clothes, and when he caught up with the others, learned that Peary had also taken an unexpected dip. With Henson in the lead breaking the trail, on April 6, 1909 they finally reached their goal, after 36 days of trekking over the ice. After they set up camp, Peary planted the American flag and Henson led a spontaneous cheer. Peary took measurements to confirm and document their location. As it turned out, they had overshot the Pole. After retracing their steps, 49 year old Henson was actually the first person to step on the geographic North Pole. It was a balmy 29 degrees below. This frozen tundra was not a place to just hang out. The six men scurried back to land in a quick 17 days. Once back on the Roosevelt, Henson got his strength back by doing nothing but eating and sleeping for four days. It wasn’t until July 17 that weather conditions allowed them to head home. They made it to Etah, Greenland on August 17, and they arrived back in New York on October 2. When Peary and Henson returned to the States, Peary received all the credit and notoriety for the incredible accomplishment. Henson, being African American, was ignored. He slipped into obscurity working a non-descript job at the Customs House in New York. Eventually Henson received due recognition for his achievement. Finally, in 1937, when he was 70 years old, he was granted an honorary membership in the prestigious Explorers Club. Henson was also awarded several honorary degrees, and in 1954 he received a personal commendation from President Eisenhower for his role in discovering the North Pole. A stamp from the United States Postal Service was issued in 1988 with the pictures of Peary and Henson. Henson died in 1955. He was buried next to his wife in New York. After some politicking from his biographer, in 1988 Henson and Lucy were reinterred next to Commander Peary and his wife in Arlington National Cemetery. His Inuit son and family were in attendance at the ceremony. * Today in Canada and Greenland the term “Eskimo” is considered derogatory. It is the term used by Henson in his memoir. The Inuit people are a group of Eskimos found in northern Alaska, Canada and Greenland. QUESTION: What obstacles keep you from trying to do something you really want to?